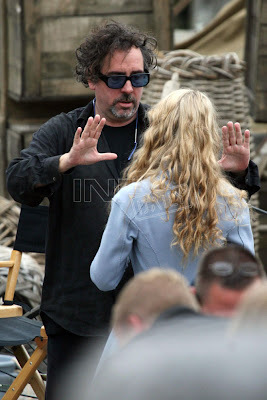 We have our first look at Tim Burton's Alice Wonderland which is being shot in Cornwall, England. The majority of the set pics focus on young Alice being played by Mia Wasikowska. As you can clearly see this isn't a computer screen or an empty stage like we've heard about for most motion-capture films, that's because it will be mixed. 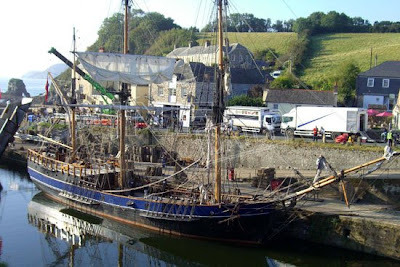 The film will feature both live-action and motion-capture. One would only assume that everything before Alice falls down the rabbit hole will be live action and the rest, in Wonderland will be in motion-capture. However there is some thought that Alice will be used in live action throughout the whole film. Clearly more to come. Scroll down to check out a couple more of the set pics and see all of them here. Thoughts on our first glimsp of Alice in Wonderland? Are you anticipating the film? Or have you tired of Burton's normal routine?